Pre-1965 90% U.S. silver coinage, aka “junk silver,” is one of the most interesting retail bullion products to follow in our industry. The premium (the amount above or below the spot price one pays when buying or receives when selling) fluctuates more with this product than virtually any other in the physical silver market. Since these coins are no longer minted, 100% of dealers’ inventory comes from existing stockpiles being resold by those who own it. This dynamic is unique to 90% silver and has resulted in some wild swings in premiums over the past few years. And today we are seeing an extreme low in premiums for junk silver coins, making it a fantastic buy. Less than three years ago, the situation was completely different. Before silver bottomed in price at the end of 2015, inventories of 90% silver bags all but dried up completely, and we saw buy and sell premiums skyrocket. When silver dipped into the $14 range around that time, premiums at Money Metals (and other national dealers) were in the $5 to $6/oz range over spot… meaning those who wished to purchase these coins were paying nearly $20/oz to do so! However, wise investors who recognized an opportunity for an arbitrage were selling their 90% silver at that time and using the funds to purchase items available for a fraction of the premium (such as 1-oz rounds or 100-oz bars). This little maneuver increased the total silver ounces they owned, dramatically in some cases. But for investors who like to stick to .999 silver, most will start off with one ounce silver bars or coins, since they are priced for those still trying to spend less on their precious metals investment. Today, we are experiencing the exact opposite situation. 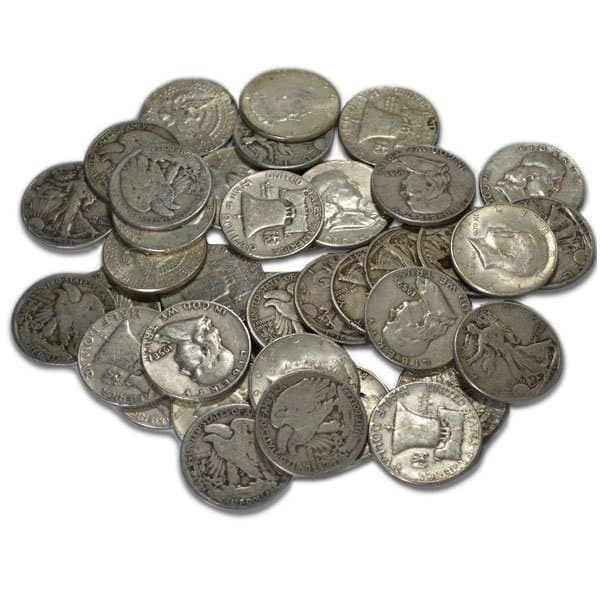 Because of a glut of inventory being sold back into a soft U.S. retail market, it is a great time to be buying junk silver – which can be purchased for only pennies above spot per ounce at present. Not only will you be buying silver at close to or below mine production cost, you will also get your metal at a price as close to spot as possible. Additionally, we are near the absolute floor – a further drop in premiums will make it more economical to melt and refine junk silver rather than sell it at such a substantial discount. There is also a fantastic opportunity to insulate yourself from a downside move in silver prices. If that happens, junk silver premiums will likely rise sharply, partially or even completely offsetting a drop in spot prices. So it’s really a win-win situation in “junk silver” right now!